Facebook isn't just for the young punks anymore — it's perfect for old people who, cast away from their families (because Americans don't value all the awesome stories their seniors have to tell about bygone times on the frontier), want to make new internet friends. The fastest-growing user demographic, according to Mashable, is women over the age of 55, but none of these older women are more venerable than 101-year-old Florence Detlor, resident of Menlo Park (and Facebook neighbor) and part of Occidental College's Class of 1936. 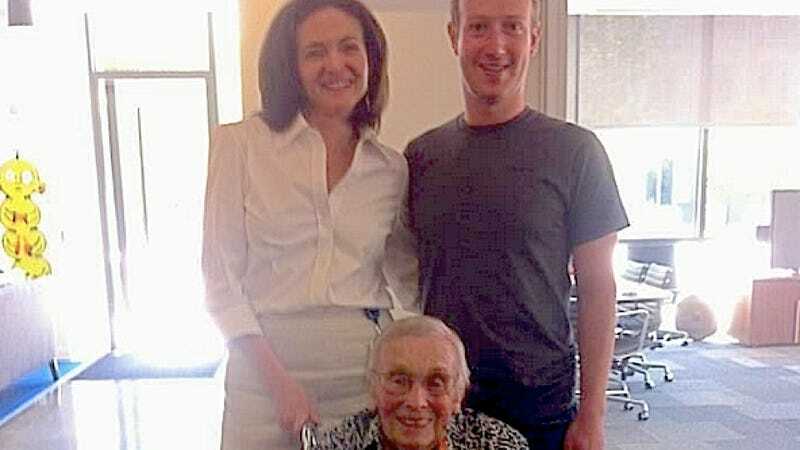 Detlor is the the social media site's oldest user, a distinction Mark Zuckerberg and Sheryl Sandberg acknowledged with an adorable photo when Detlor visited Facebook headquarters on Monday. Thus far, the soon-to-be-MOMA-triptych has garnered 5,000 Likes, as well as comments from hyper-competitive people claiming to have 102- and 103-year-old grandparents on Facebook. Detlor, however, doesn't seem to pay all the wannabes any mind because she's too busy "looking for a good book to read" (status update) to worry about the other centenarians who want to meet Jesse Eisenberg in person.